The intersection of 3D printing and education has brought about some amazing things. 3D Printers in the classroom have changed classrooms 10 fold since the time their 2d predecessors made it into classrooms in the 1980s. I personally have vivid memories of the creations we made with Printshop and a dot matrix printer. Can somebody say alphabet banners that were 20 feet long. When you take a 3D printer, capable of rendering just about any inanimate 3d object, and put it in a classroom full of creative kids, amazing things happen. Take the story of an 8th grade class at Swanson Middle School in Arlington Virginia. 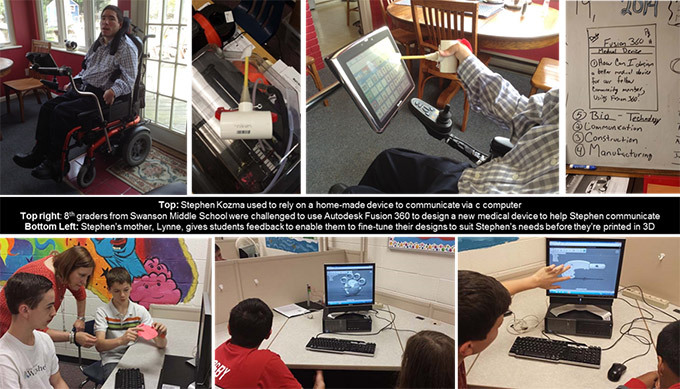 These creative students decided they would redesign and fabricate a medical device to help Stephen (a disabled student from the community who doesn’t have full use of his hands) to better communicate and improve his daily life. Prior to this, Stephen was using a home-made device to operate his communication device on his wheelchair. 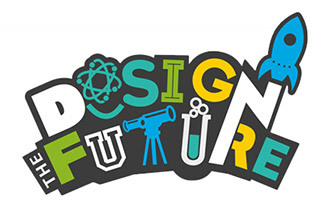 By adopting Autodesk’s Design the Future program, the young makers were able to use 3D design software to digitally model their original ideas from scratch. They also discussed their concepts with Stephen’s mother at length, and fine-tuned their designs with her feedback to ensure they met Stephen’s needs before printing them in 3D for him to test/use. These eighth graders were able to use a professional cloud based design tool that is used every day by hundreds of thousands of design professionals, to create multiple design concepts. Stephen was able to participate in choosing which designs he liked the best and which would prove to be most useful to him. The students, Stephen included, were able to chose from and apply textbook engineering and science concepts, typically suited to a much older learner, in real life. These are the same tools/workflows that professional engineers and designers use in the industry every day – and these students are proficient at using these tools such a young age. Examples like this demonstrate how access to the design technology in the classroom can inspire a #NationofMakers, advance STEAM (including Art) education, and help tomorrow’s creative leaders imagine, design and create a better world. Teachers, administrators and education professionals headed to ISTE 2014 in Atlanta June 28th-July 1st can check out Autodesk at booth 1634.